Germfree’s BSL-2 Shipping Container Labs are easily transportable units that can be installed in even the most remote locations. They are built into specialized ISO shipping containers for easy global deployment to all ports. 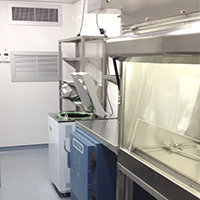 We designed the BSL-2 Container Lab to fill the need for a high quality and cost-effective laboratory. 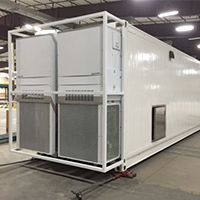 Made from superior construction materials, our Container Labs provide reliable HVAC, filtration systems and simplified controls. Germfree also manufactures BSL-2 Enhanced (BSL-2+) laboratories. Germfree’s innovative containerized lab concept provides easy intermodal global shipping options. Single and joined double-container configurations are available. There is a call for new laboratory capacity to fill current and emerging deficiencies. Sub-par BSL facilities have created major challenges to the global public health community. Many governmental, research and public health institutions have aspired to construct BSL-3 labs. However, the initial installation, effective ongoing operation and maintenance of BSL-3 is often not practical and sometimes BSL-3 is not needed. Germfree’s ISO-Lab2+™ is a turnkey BSL-2-Enhanced facility that presents a new option for areas that lack suitable and sustainable laboratory capacity.